Is Salt a Natural Resource in Romania? Salt is probably the last things that you would think is a historically significant resource since the post about Gold in the Carpathian Mountains. 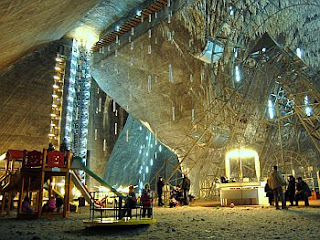 However, the salt mine, Salina Turda, located in Durgău-Valea Sărată area of Turda has been a tourist destination since 1992. But before being reopened as a place for tourists to see how salt was mined and to relax in the theme park like environment, this mine was providing salt as far back as the antiquity (not able to pinpoint and exact date, however we are talking in the BC years). In the middle ages it provided table salt, 1075 was the earliest written mention of the mine, up until 1932 when the mine was closed. The salt deposits themselves, date back to approximately 13.5 million years ago. The mines where all carved by hand and machinery, never once using explosives. When the mine was first written about it was under Roman occupation. The exploitation of the Romans in the Salt quarries were rectangular and with upturned steps. Once they hit a depth of 12-15m and it was too deep to get the salt up the inclined planes at one of the quarries end the site was abandoned and another one started. After the Romans withdrew from the area and then up until the 11th century there were no longer evidence that the salt was being exploited by an outside influence. Its then believed that the salt was then used for the countries internal needs and then exporting it to the neighboring countries as needed. The salt mine in Turda made mention in another document dated May 1st, 1271. It was offered to the Head of the Catholic Church of Transylvania. It did not say of what purpose of the offering or if the Head of the Church accepted. The salt mines dropped out of the historical spotlight but resurfaced in 1552. After a decrease in the mining rhythm, royal inspectors were sent to report back on the quality of the salt, the method that is used to remove the salt and the quality of the workers. In the 17th century the salt was in growing demand which increased the importance in the mining of the resource. So important that the salt mines were controlled directly by the Imperial Court. In 1690 mining began around the perimeter of the actual salt mine. Wells named Theresa (Terezia) and St. Anthony (Anton) were opened. Not until 1867, when Johann Fridwaldsky a mineralogist, published a book "Minerlogia Magni Principatus Transilvaniae did the world really see the scope of the salt mine. Johann Fridwaldsky presented the mines in great detail, the way they were built, salt conveyance, how the workers avoided getting water and the condition of the miners themselves. Within the workers he also detailed which one were trades people and which ones were "unqualified workers" and to which mine that they worked on. All extraction of salt was stopped in 1932 (however, after searching multiple sources I can't find the reason why they stopped). After being closed down the mine had other functions before turning into a tourist attraction that it is today. During World War II the mines were used as bomb shelters and the humidity was just right for storing cheese. Theresa mine is still in use today as part of the attraction. At 370 feet deep, visitors can rent boats to take a tour of the mine, along with many other fantastic places. Pictures of Salina Turda are breathtaking, a complete marvel of engineering for the time. But until I get over my claustrophobia, pictures of the cramped hallways are the closest I'm getting to the mine.